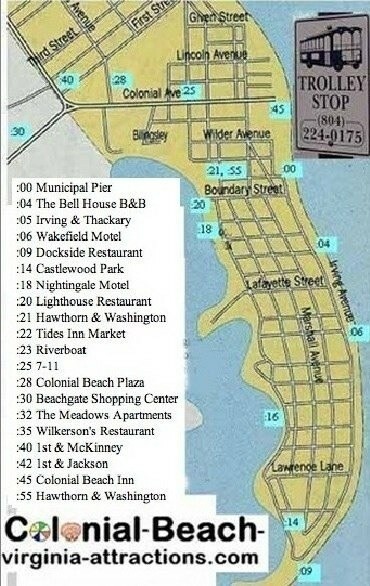 To the right is a map of Virginia's Colonial Beach area showing the Town Trolley route. The Trolley runs during the Summer months beginning Memorial Day weekend and makes about 20 stops around town. The town is shaped somewhat similar to the state of Florida, with the beautiful Monroe Bay on the west side and the Potomac River on the other. On "the Point" there's a large marina and a waterfront restaurant and tiki bar. There are mainly private residences between there and the main part of town where you will find shops, more restaurants, parks, marinas and the beaches. 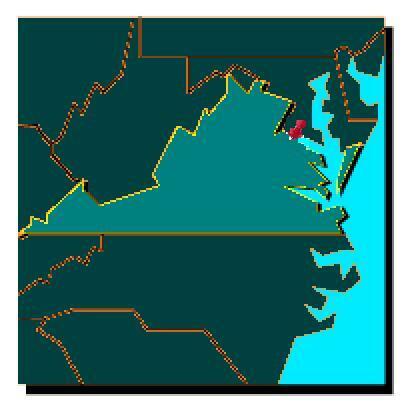 Below is a map of Virginia showing Colonial Beach's location (red pin), and another showing the Commonwealth and her surrounding states (Maryland, West Virginia, North Carolina, Kentucky and Tennessee). 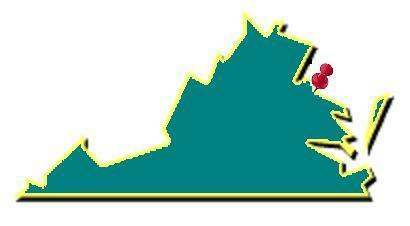 We're located about halfway between Washington D.C. and Richmond. We're about 40 miles east of Fredericksburg. 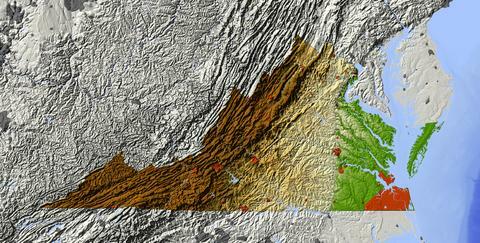 The Commonwealth has some mountains in the western part of the state, a few low-lying swamps and all elevations in between, as shown on this relief map. One-fourth of the Appalachian Trail lies in Virginia. The Colonial Beach area is roughly ten feet above sea level. This interactive map of Virginia marks the locations of shops, restaurants, rental cottages and more in the Town of Colonial Beach. Just scroll over the markers and arrows for more information and links to applicable websites. You can even zoom and pan. On I-95: Head north on I-95 to Exit 104: Carmel Church/Bowling Green. Keep right at the exit and yield to traffic. Go straight and follow this road (Rt. 207) until it turns into Route 301. Keep following it until you get to the intersection of Routes 301 and 3. You'll see signs for George Washington's Birthplace. Turn right and go for about ten miles. You'll come to a stoplight where there's a Shell gas station ahead on the right. Turn left at this intersection onto Route 205. Take Route 205 for about 9 miles and viola! You're in Colonial Beach! Welcome! Shortcut: Turn right onto Jersey Road from Route 301, and follow that to Route 3. On Route 360: Enjoy the scenic drive on Route 360 towards Tappahannock. Once you get to Tappahannock, turn right and cross over the Rappahannock River and head towards Warsaw. Turn left when you get to where Route 360 intersects with Route 3. There is a stoplight here. Follow Route 3 through Montross and keep going. After about 10 miles you'll see a Shell gas station ahead on your left. Turn right at this intersection, onto Route 205. Follow Route 205 for about 9 miles and viola! You're in Colonial Beach! Welcome! Alternate Route: A mile or so after you cross the bridge over the Rappahannock, take a left onto Route 624 - Newland Road from Route 360. This will eventually become Flat Iron Road. Take a left on Route 3. This will be a "T" intersection. Then follow the directions from Montross above. On I-95: Exit 130 will put you on Route 3. Head east on Route 3 for about 35 - 45 minutes. You'll come to a stoplight where there's a Shell gas station ahead on the right. Turn left at this intersection onto Route 205. Take Route 205 for about 9 miles and viola! You're in Colonial Beach! Welcome! On Route 301: Take Route 301 South towards Waldorf, MD. Keep going until you cross over the Harry W. Nice Bridge into Virginia. There is a $6 toll here, it's a lot less if you have an EZ-Pass. Follow for about 4 miles and you'll see a sign that points left towards Colonial Beach. This is the stoplight at Rts. 301 and 218. Turn left, and keep going until the road comes to a "T" (Pumpkin Neck Road will be on your left) and at this point, turn right and go up the hill. Turn left at the next "T" intersection onto Route 205. Careful as this is a hazardous intersection. The Virginia Department of Transportation will be installing a stoplight here in the Spring of 2014. Follow this to Colonial Beach. You'll see a McDonald's on your right. You're here! Welcome! DETOUR: November 2, 2012 to March 1, 2013 The bridge near Wilkerson's Seafood Restaurant WAS closed for repairs. To get to Colonial Beach from Route 301, take Route 205 to Longfield "Dragstrip" Road (Route 631) and follow that to the newly-installed temporary stoplight, where you will make a left turn. From Route 3, turn onto Route 205 (at the Shell gas station) and follow that in to the beach. If you're arriving by water, the entrance to Monroe Bay is located at approximately latitude 38°13'7"N and longitude 76°58'90"W. We have plenty of marinas with transient slips available. Richmond is just under two hours southwest of Colonial Beach. Click here to see options for attractions not far from the Colonial Beach area. These include amusement parks, historical sites, cruises and more.